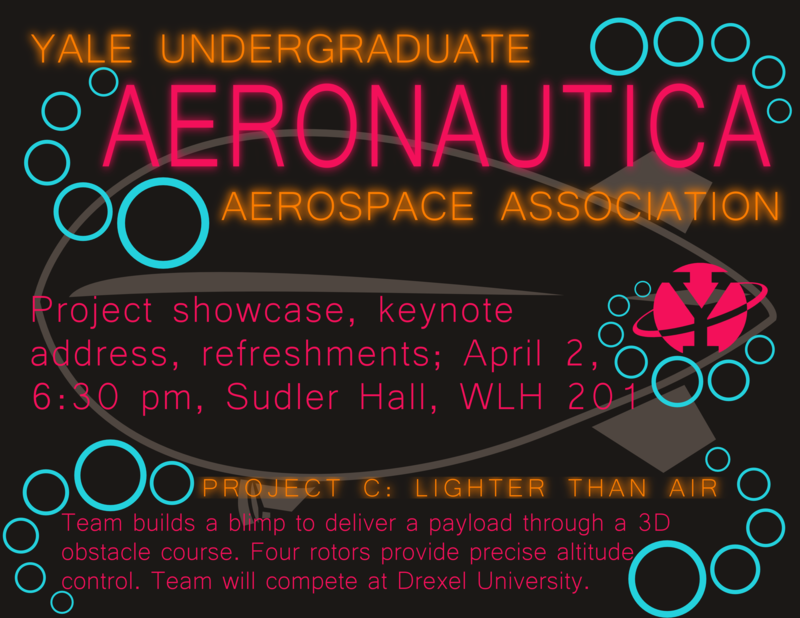 YUAA members are gearing up for Aeronautica which will be this Wednesday, April 2nd at 6:30 pm. Stephen Hall (‘14) and Jan Kolmas (‘14) will give a keynote address discussing the progress of the organization over the years and this year’s projects. Project teams are hard at work preparing for launches, flights, and competitions and are eager to share what they have been doing with the larger YUAA and Yale community at the project showcase and reception. If you joined us last year come hear about the great success of the Astro-Egg Lander and Eli Whitney at the Battle of the Rockets Competition last April. Attendees this year can also expect to see multiple rockets, flying blimps, and a plane with rotating wings.